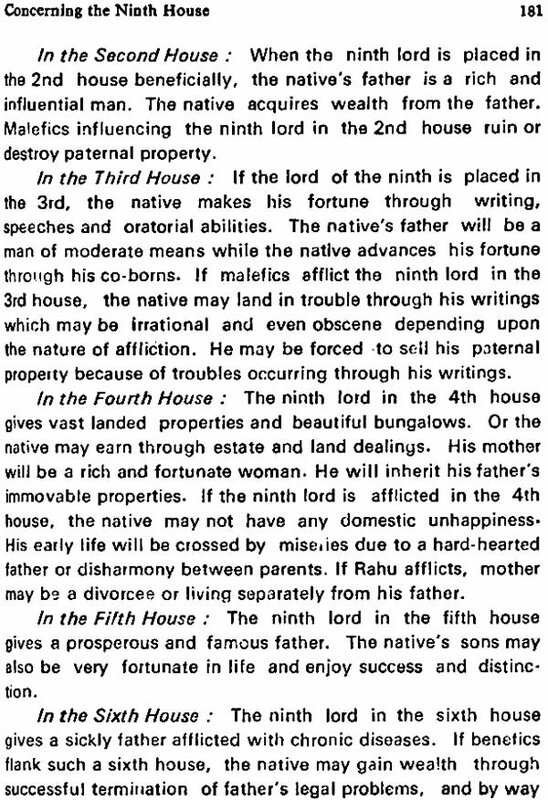 Volume II deals with houses VII to XII. 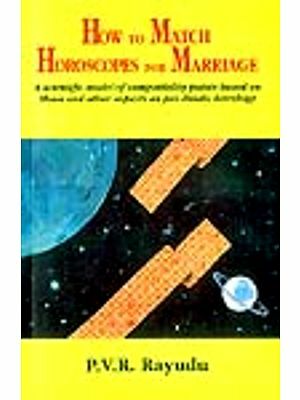 The Seventh House represents wife, husband, marriage, sexual diseases, business partner, diplomacy, talent and general happiness. 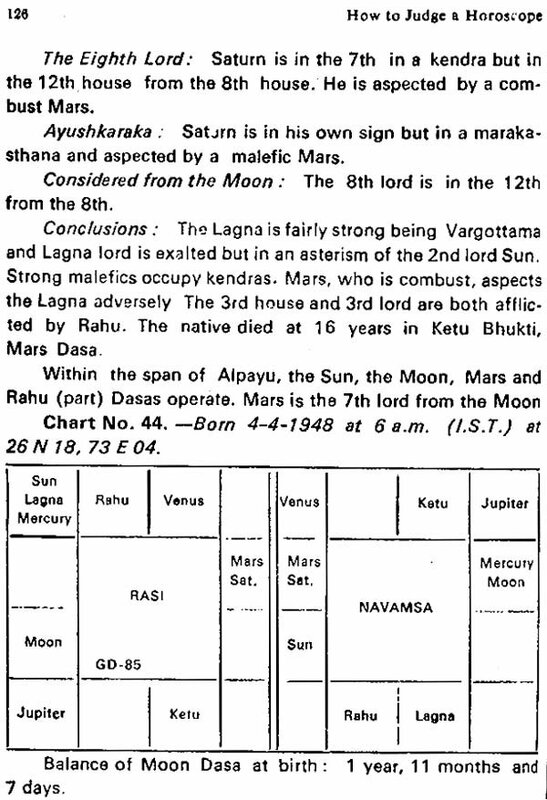 The Eighth House indicates longevity, legacies, disgrace, degradation and details pertaining to death. 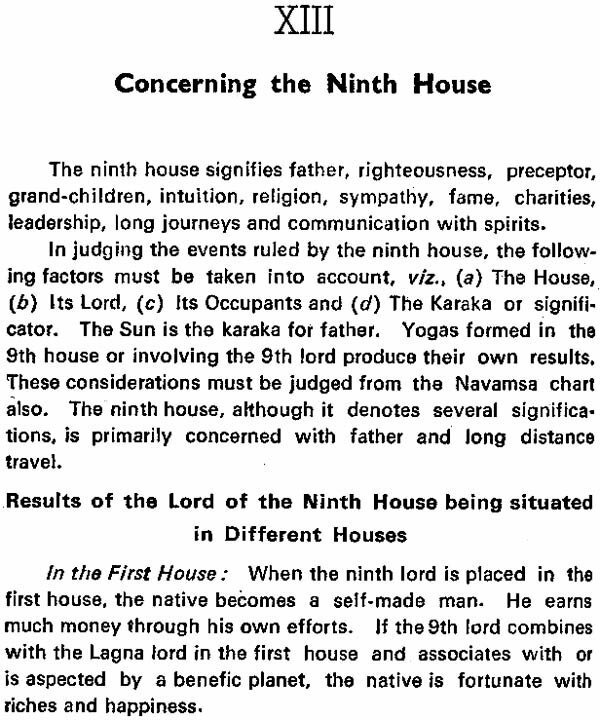 The Ninth rules father, righteousness, religion, fame leadership, journeys and communications with spirits. 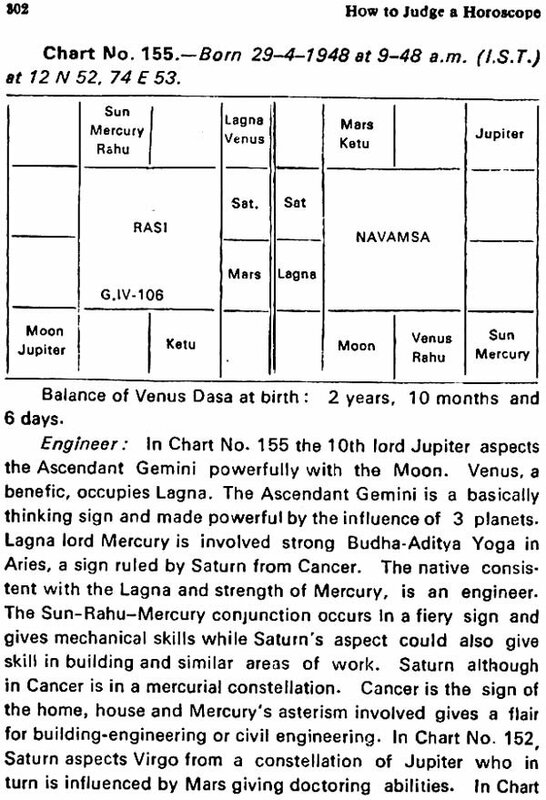 The Tenth indicates occupations, profession, honours, foreign travels and means of livelihood. 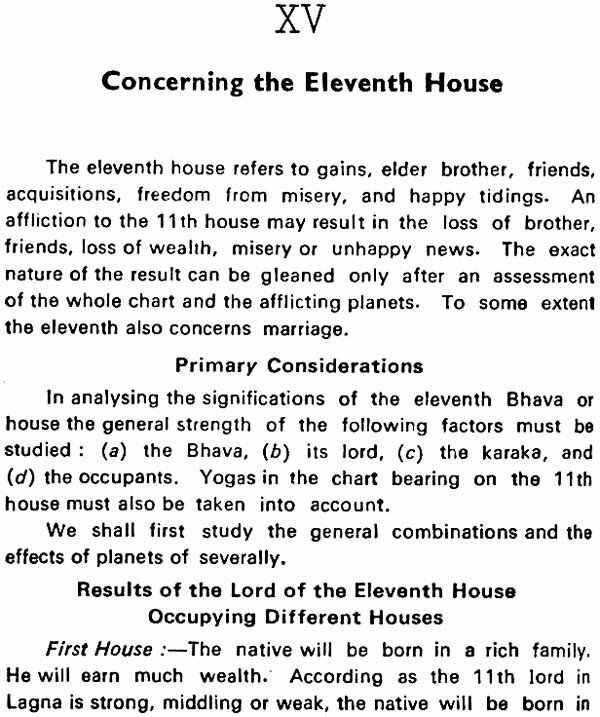 The Eleventh represents means of gains, elder brother and freedom from misery. The Twelfth rules losses, expenditure, sympathy, divine knowledge, moksha and the state after death. 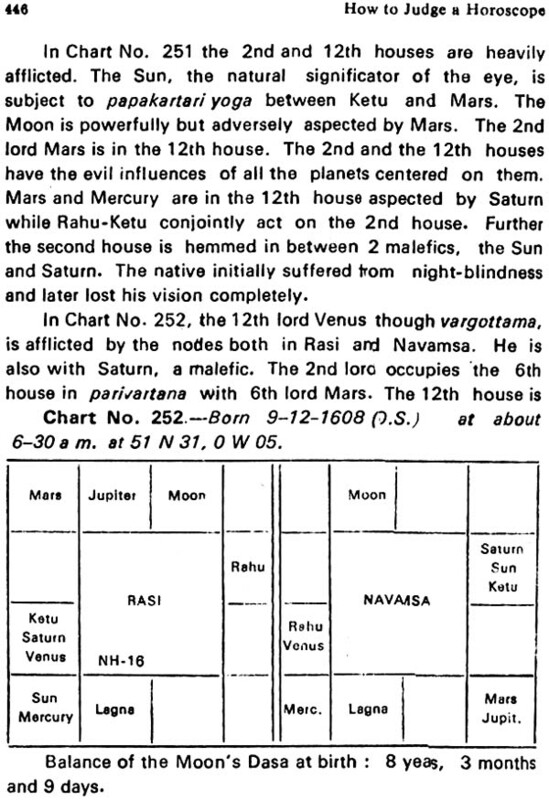 In the second book, Dr. Raman provides an astrological treat to the practitioners and students of the science by detailing three hundred planetary combinations that point to the Yogas (fortunes) and aristhas (misfortunes) with 150 practical illustions which he claims he had gathered from actual lives. 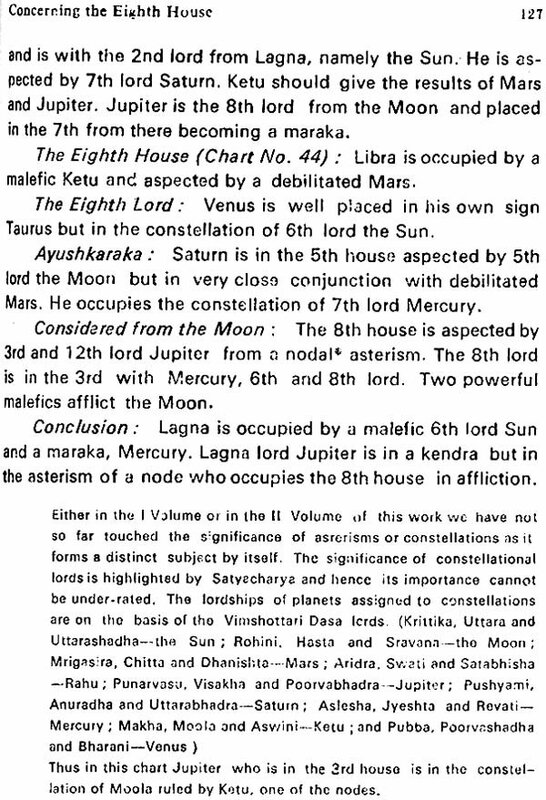 - R. Parthasarathy, The Hindu, October 5, 1993. The first edition of the first volume dealing with Houses 1 to 6 was published in 1941. For various reasons not worth mentioning preparation of the second volume had to be delayed all these years until my daughter Gayatri Devi Vasudev came forward a year ago and took up the preparation under my guidance. But for her assistance, the second volume would not have seen the light of day. The second volume deals with Houses 7 to 12. It can be considered as more important than the first volume because it covers such important matters as marriage, occupation, etc. The pattern of writing is more or less similar to that adopted in the first volume results of the disposition of the lord of a house in different houses, general combinations bearing on the houses, results of different planets occupying the house and the time of fructification of such indications followed by a under of practical illustrations. 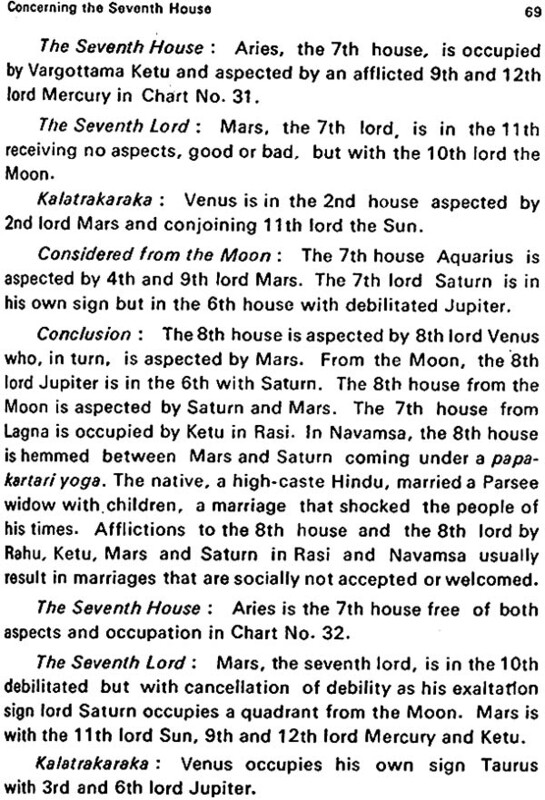 In fact the treatment of the seventh and tenth houses is so exhaustive that such details as the possibility and time of marriage, its break-up and re-marriage, nature of wife, her character, disposition, status, number of marriages, etc., have all been dealt with exhaustively. 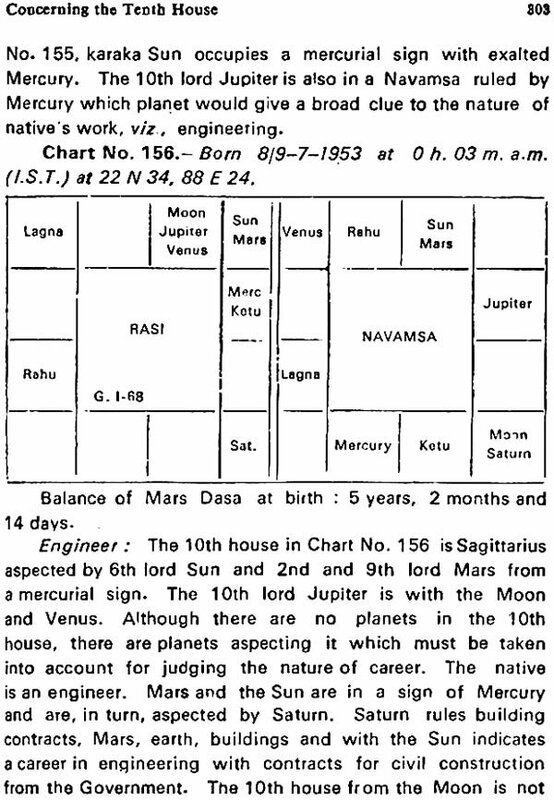 So far as the tenth house is concerned it is the pivot of the horoscope—whatever is astrologically possible to indicate the nature of profession in the present political, social and economic set-up has been explained as clearly as possible. 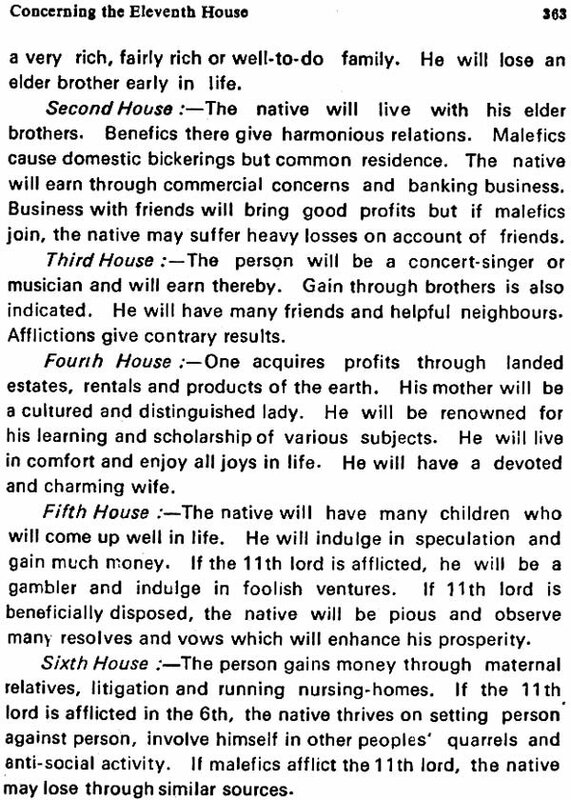 The other houses, viz., eight (longevity), ninth (general fortune, foreign travels, father, etc). 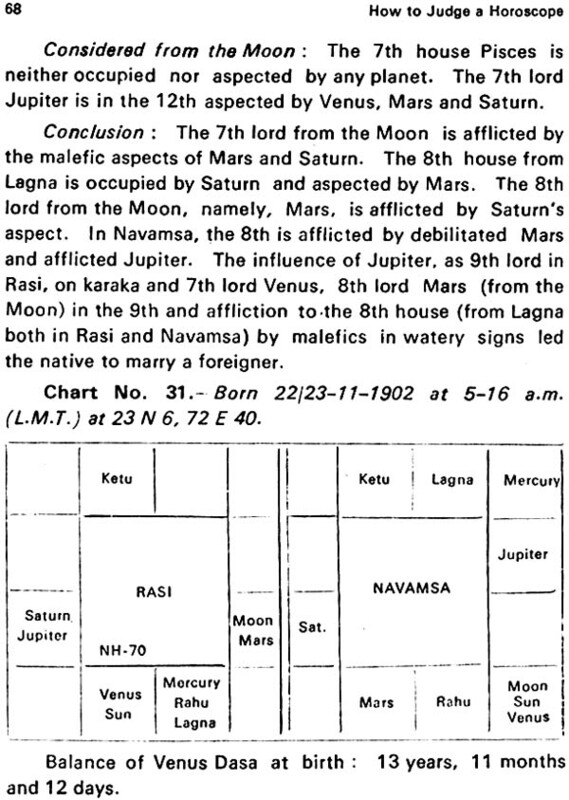 11th (financial gains) and 12th (losses, spiritual advancement, etc.) have not been under-rated. They also received due attention. In the judgement of a horoscope an astrologer faces many a pitfall. 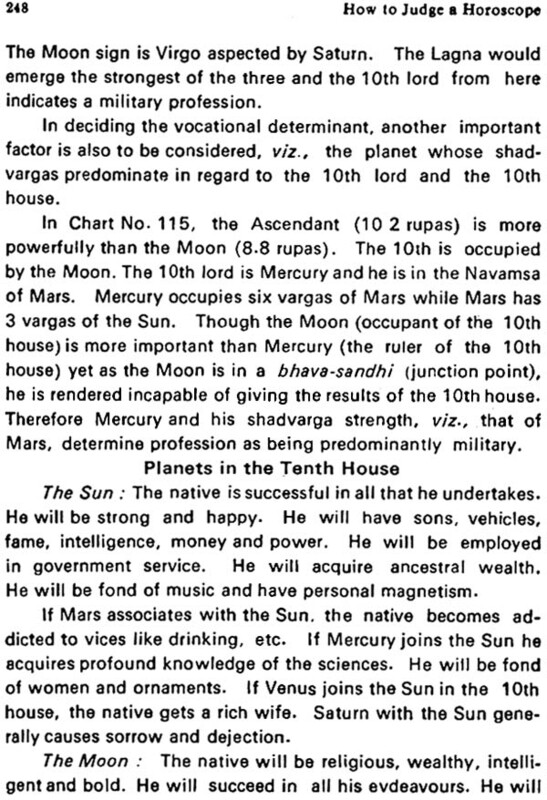 How to overcome such pitfalls and arrive at a judegement have been explained with suitable illustrations. 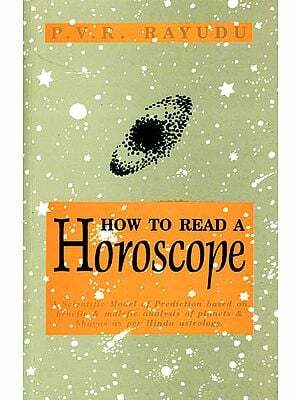 The book has been illustrated with over 260 charts and is therefore of great practical importance to all those who wish to study astrology. 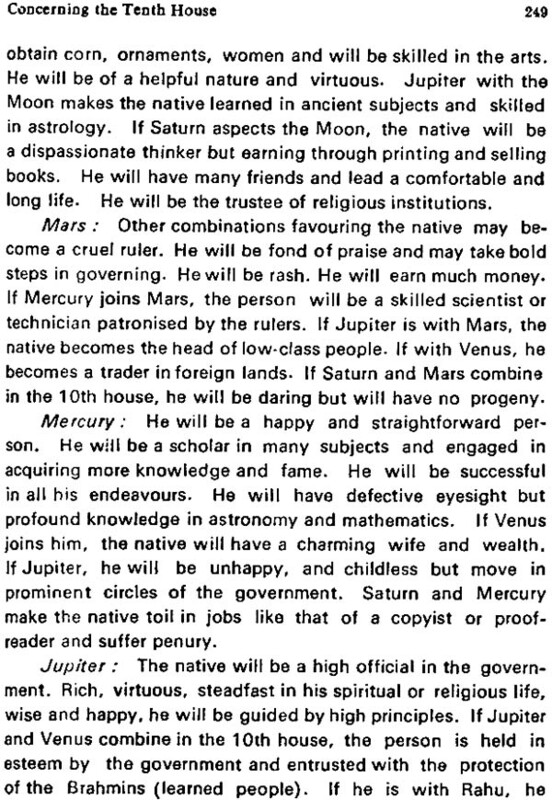 The first and second volumes covering the entire gamut of predictive astrology, especially in its practical aspect, will be found to be of immense us to all those who are interested in the subject- professors, amateurs and savants. I hope the educated public will extend to this volume the same indulgence it has done to my other writings. 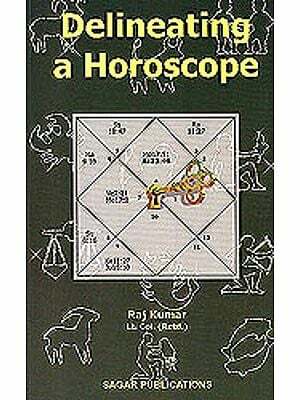 Thanks are due to Messrs. P. N. Kamat and G.K. Ananthram of IBH Prakashana for bringing out this volume attractively.